Yesterday I shared some things I've learned about asset based community development (ABCD). I told you a couple stories. I took you to Honduras and brought you back to Ohio. So what in the world does this have to do with breastfeeding? Well, please take a moment to read yesterday's post first, then hop back here to find out. If you've read anything on this blog before then it's likely you know that breastfeeding in the US is the exception, not the rule. Incidents pop up in the news every few months about breastfeeding moms who are chastised for nursing their babies in public. Here in Ohio, only 21.6% of moms are breastfeeding their babies at all at 6 months. It doesn't take more than a few conversations with other mom friends to hear about advice they were given from their pediatrician or OB that doesn't align with current best practices for breastfeeding. This is the bottom line: our culture is impoverished when it comes to knowledge, passion, and compassion regarding breastfeeding. Please please don't hear me wrong. I'm not saying an individual mom is "poor" because she doesn't breastfeed. I'm simply saying that anecdotes and news articles and statistics show us that we are a culture that doesn't value this practice. We believe myths about it. We compare it to defecating. We don't understand it, and in some cases maybe even fear it. When there is poverty, do you remember what works? Asset based community development. Yes, there is a need for systemic change. Better education in WIC programs. More baby friendly hospitals. More lactation education in med schools. ABCD can be implemented at those levels. But as I go down this list, I can tell you pretty quickly that I have next to no pull in any of those fields. My sphere of influence consists of my friendships with other moms. Change will come from grassroots efforts manifested in real relationships. 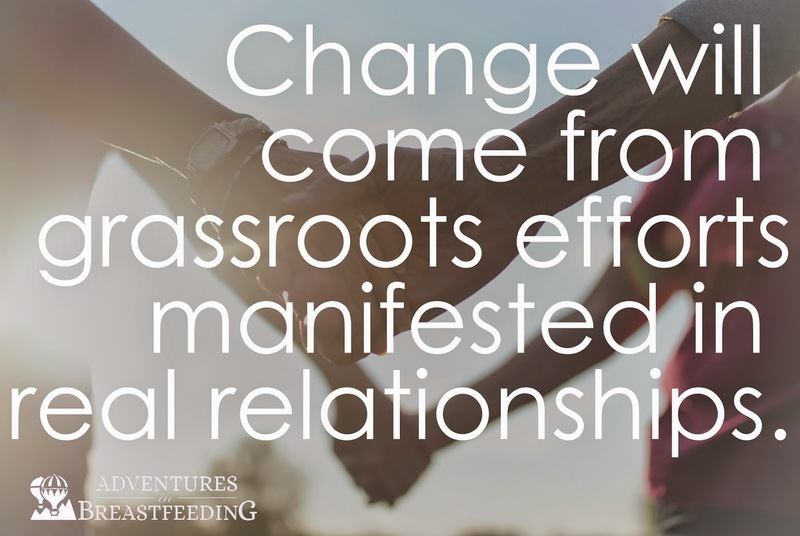 I am passionate about advocating and educating and rallying around the breastfeeding cause, but like I shared yesterday, sustainable change will come when I am willing to let go of that cause long enough to grab onto a close relationship and hang on tight. I'm digging in for the long haul, just like my wise friend Tracy. I'm not trying to dispense advice or dispute myths in every conversation. I'm striving to be a better listener and evaluate what my friend is showing me she needs instead of starting with what I have to offer. I'm ready to acknowledge that sometimes my friend may simply need to be heard and cared for instead of admonished or corrected. Instead of focusing on everything she doesn't know about breastfeeding, I'm going to simply be present so I can notice what a great mom she is and how much she loves her kids and tell her how much I respect that. And after listening, after building trust, after I've spent time focusing on her instead of me, I will be ready if she asks me for help. I will be there for her as a collaborator instead of a teacher. The way I can make a difference in our impoverished breastfeeding culture is by investing in true friendships because I value individual moms. And the payoff is way bigger than the freedom to nurse anywhere in public without criticism, or having bosses who are knowledgeable about your pumping needs, or L&D nurses who understand how crucial it is to have baby at your breast soon after birth. No, these are possible offshoots of this change, but they aren't the ultimate goal. The victory will be evident in the community we will have cultivated. Moms who are empathetic and truly care about each other's tears, triumphs, and tatas. Moms who value each other not because of a breastfeeding cause, but simply because people matter. Look at your own assets. What do you bring to this conversation? 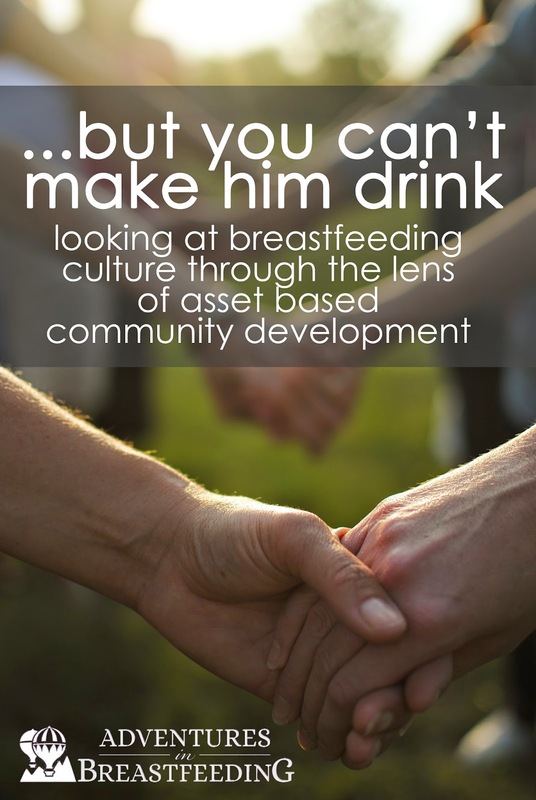 How can you contribute to our impoverished breastfeeding culture? Laura, this is a wonderfully clear and compassionate message: thank you so much for writing it! It's important to remember that however much breastfeeding is a biological exercise and social good, there are real people at the heart of it. A lovely and timely series of posts! What a powerful message! Thank you for sharing how we can all do our part to pass on better knowledge and information regarding breastfeeding. I am quite wealthy when it comes to breastfeeding, which I am fortunate for, and I love being able to bless those less fortunate with the knowledge and support to see them grow in wealth with their breastfeeding journey.